When a car hits a pedestrian, the outcome can be catastrophic or even lethal. In many cases, pedestrians struck by vehicles suffer serious injuries due to the lack of a buffer between the pedestrian's body and the vehicle. In some cases, victims are killed by the impact of the vehicle, and in those cases, it may be possible to open an estate that can bring a claim on behalf of the deceased person with the assistance of a transportation accident lawyer. The family of the victim can claim their losses as well. At Moll Law Group, our Chicago pedestrian accident attorneys are available to represent you in a lawsuit for compensation if a careless driver has struck you. In most cases, someone who is injured in a motor vehicle collision must sue the driver responsible and prove negligence by a preponderance of the evidence. In many cases, you need to bring a personal injury lawsuit within two years from the date of the accident. In some cases, a much shorter notice period is required. If you fail to bring the suit within that period of time, you may lose the right to sue altogether. To establish negligence, you need to prove the defendant's duty of care, a breach of duty, actual and proximate causation, and actual damages. One way to show that the defendant breached his or her duty in Illinois is to prove a violation of the Illinois Motor Vehicle Code. For example, a driver who hits a pedestrian after failing to stop at a posted stop sign or who is driving drunk will likely be found to have breached the duty of reasonable care. In more complicated cases, it may be appropriate to retain an accident reconstruction expert. The expert can look at property damage, injuries, debris, skid marks, and eyewitness testimony to determine whether there was a breach of duty. A pedestrian accident lawyer at our Chicago firm can help you retain a knowledgeable expert. In some cases, the defendant driver may have been in the course and scope of employment at the time of the accident, in which case you may also want to name the employer as a defendant. The employer may be held liable under a direct liability theory, such as negligent hire, or an indirect liability theory, such as vicarious liability. In some cases, a pedestrian may be partially at fault for an accident. Illinois follows a modified form of comparative negligence. As long as the plaintiff is found to have been less than 51% responsible, the plaintiff may recover a damages award that is reduced by her percentage of fault. The jury will determine the total damages and then assign each party a percentage of fault. 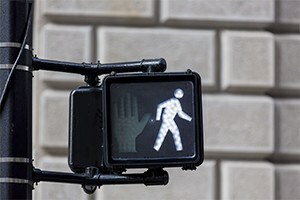 If you have been hurt or lost a loved one because of a careless driver, the Chicago pedestrian accident lawyers at Moll Law Group are available to help you pursue compensatory damages. These may range from lost income and medical expenses to pain and suffering or other non-economic forms of harm. We represent injured individuals and their families across Cook County, as well as in Schaumburg, Naperville, and Wheaton. Billions of dollars have been secured in cases in which our car crash lawyers have been involved. Call us at 312-462-1700 or use our online form to set up a free consultation.